Those basic inquiries are undoubtedly the most used, but there are a series of lesser known weather features that aren’t listed in the big commands list that will provide detailed climate information that are also easily accessible. 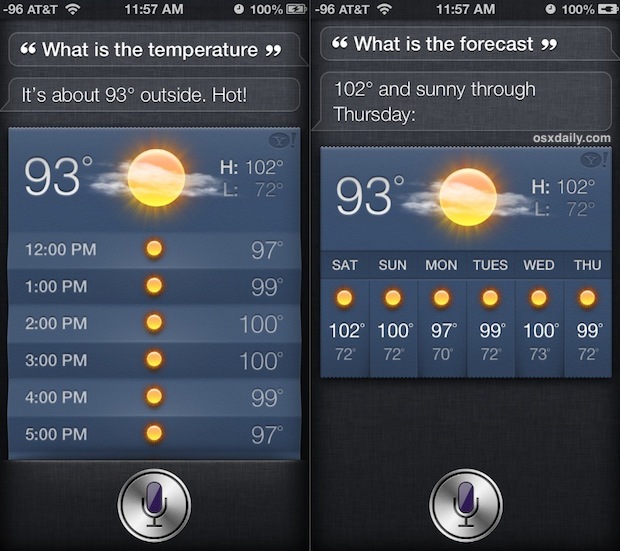 These questions will have Siri provide you with information on humidity levels, wind speed, atmospheric pressure, and the dew point. Of course this type of weather info is quite specific and not necessarily useful to everyone, but if you’re a weatherman, a weather nerd, or a pilot, you’ll probably be pretty excited that you can get this type of information instantly from your iPhone or iPad. 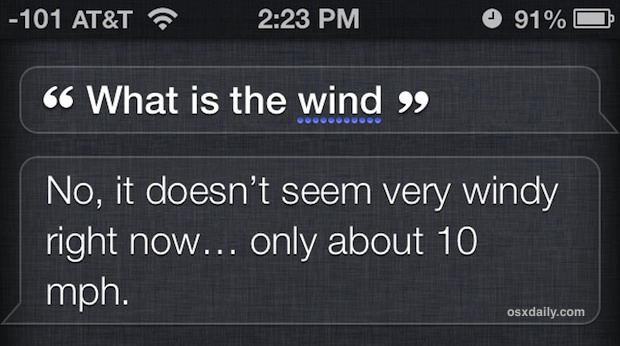 Want to know if it’s windy or not before stepping outside, or before heading to another destination? 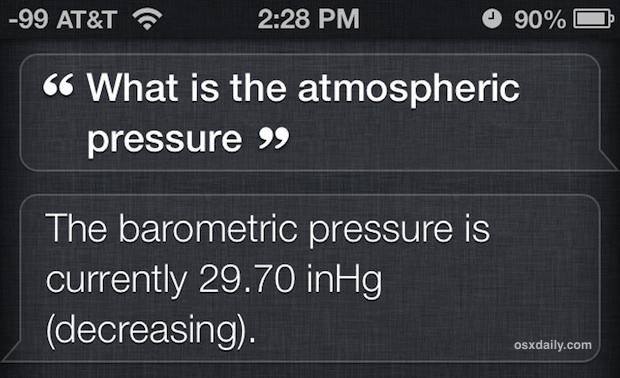 Want to figure out the barometric pressure here, or elsewhere? Wondering what the dew point is at your current location, or a destination? Sorry skiers, snowboarders, and snow sport lovers, there doesn’t seem to be a way to get the freezing level from Siri, at least by asking any question directly like “what is the freezing level”. This seems like an odd oversight given that all the iOS codenames are named after ski resorts, clearly Apple employees enjoy the white room, but this will probably be added soon… maybe in time for next season if we’re lucky. If you know any additional weather tips or interesting tricks with Siri, let us know through Twitter, Facebook, Google+, or send us an email.